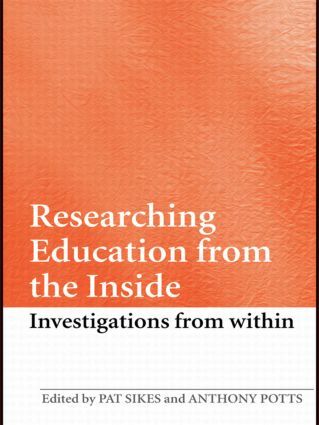 Researching Education from the Inside focuses on research projects that are undertaken by people who already have an attachment to the institutions or social groups on which their investigations are based. They can, therefore, be considered to be ‘insiders’. In some cases their insider positioning is primarily important because it gets them access to the particular people and/or the phenomena that they want to investigate. At other times, however, aspects of their own ‘insidership’ will, in itself, come under scrutiny. Interpretation of findings including validity and reliability. Failure to properly consider these key factors can lead to disastrous consequences for any research but it can be a special problem for insider investigators. These vital issues are discussed by an impressive range of contributors in this ground-breaking book, making it an invaluable resource for anyone participating in Insider Research. Introduction: What are we talking about? And why? Is it all about me? How Queer!